The experience of passing through a portal can vary greatly from portal to portal. 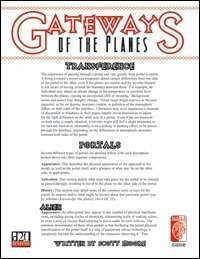 A living creature's senses can frequently detect certain differences from one side of the portal to the other, even if the planes are similar and the traveler himself is not aware of having crossed the boundary between them. Background scents and noises may abruptly change. Visual range might improve or become impaired, as the air density, moisture content, or pollution of the atmosphere differs on both sides of the interface. Characters may even experience a moment of discomfort or blindness as their pupils rapidly resize themselves to adjust for the light difference on the other size of a portal. Even if the environment on both sides is nearly identical, a traveler might still feel a slight resistance to his forward motion or, alternately, even a pulling or pushing effect, as he passes through the interface, depending on the differences in atmospheric pressures between both sides of the portal. This 10 page PDF is just the sort of thing needed for DMs to get started playing in the many realms in the fantasy worlds. Written by Scott Moore. This title was added to our catalog on May 08, 2007.